My Beatport DJ chart September 2014 is available! Some tunes are included in my Soundcloud Mix September 2014 aswell! My Soundcloud Mix September 2014 is available! My Soundcloud Mix Series is back with 16 fresh tunes mixed into just one hour! It features tunes and remixes by artists like Federation, Andy Moor, Nitrous Oxide, Aizen, Cold Blue and many many more! Stream+Download enabled, enjoy! 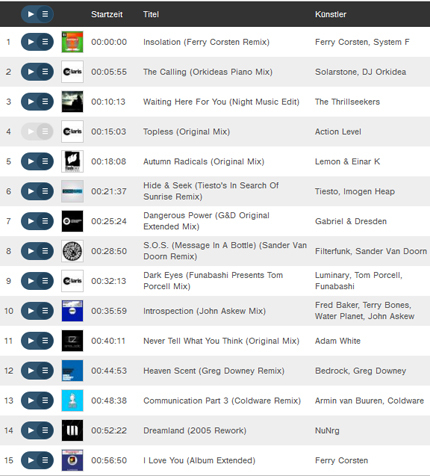 Currently on Facebook there’s are many posts about personal Trance Classics Top 10 charts so I decided to post my own one aswell in descending order. Starting from place 10 up to number 1. My chart is also available as a 40 mins mix on Soundcloud as stream & download. Till today Simon Patterson is one of my favorite producers. Recently he decided to move to more slower, psychedelic stuff which I also love and support. Many years ago, together with Richie Kayvan, he was part of the vocal trance project Dogzilla. The project can be described at best as uplifting vocal rock trance. The reason I include Frozen into my chart is because it’s style is also very unique, uses clever lyrics and a lush melody. Here’s another tune I include to my chart because it’s remix takes it to a total different level. I can’t say much about the Original Mix of Ice Beach but for me Jonas Steur’s Remix of it is his best production till today and really deserved a place in my Top 3 of Trance Classics. Before remixing Ice Beach Jonas produced tunes like Castamara or Silent Waves, which I also really love, but none of them reached the perfection of Ice Beach. This 9:18 mins production is something every trance addict should have heard. Tic Tac Trance #081: Replay Available! 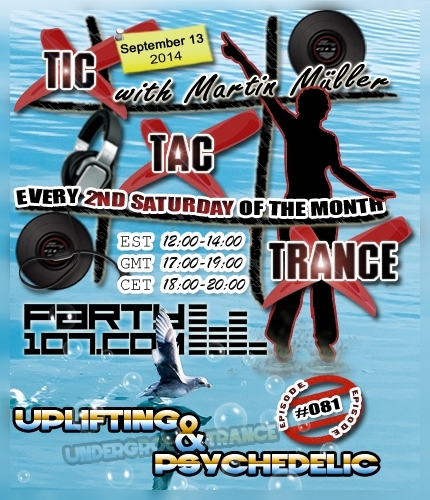 Tic Tac Trance returns on September 13 2014 with episode #081 on Party107.com. You can expect for this show a 2 hours uplifting & psychedelic underground trance mix which features tunes of labels like Black Hole, Abora, Iono Music, Critical State, Blue Tunes and many many more! Make sure to tune in! My first Beatport Mix is available for purchase! This is something I wanted to do for a long time and finally decided to try it out. If you like classic trance tunes, combinded with a technical high mix quality, this is something for you! I had no impact on the price. I had no impact on “album only” or “mix only” track-definition. If you buy the mix and help to support me with the purchase I will only own 10% of it, that means 79cents. Don’t worry, my free Soundcloud & Mixcloud mixes or show replays will continue. Thanks again for the great support and I would be happy to get some feedback if you like it or not!